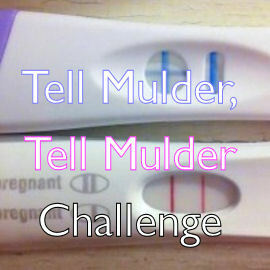 Your challenge is to write a fic in which Mulder receives the news that he is going to be a father on two different occasions. While many writers will choose write about Scully telling Mulder that she is expecting William and set the other pregnancy later, you don't have to. You may write about a pregnancy earlier than the one with William, exclude William entirely from your story's universe, or set both pregnancy announcements after Existence (Scully actually saw Mulder in Trustno1? post-The Truth? Post-IWTB?...). Your story's plot may extend timewise well beyond Mulder getting the news the second time if you like. If you wish, you may select a different X-Files character to get the news that he's going to be a dad twice over. Got a tale to tell about Doggett, Skinner or Krycek instead? Have at it! Do you have questions about writing a challengefic before you can begin your story? Look here to see if you can find your answer.